The Kings Cross Lighthouse Building – a tenant perhaps, but how will construction actually be done? The big question though is just how construction will take place on a highly inaccessible site – it’s surrounded on all sides by hectic roads in the deadly Kings Cross Gyratory. Thanks to Lisa for sending in the link. This entry was posted in Planning, Licensing and Regulation and tagged lighthouse. Bookmark the permalink. 5 Responses to The Kings Cross Lighthouse Building – a tenant perhaps, but how will construction actually be done? The gentrification of King’s Cross continues. 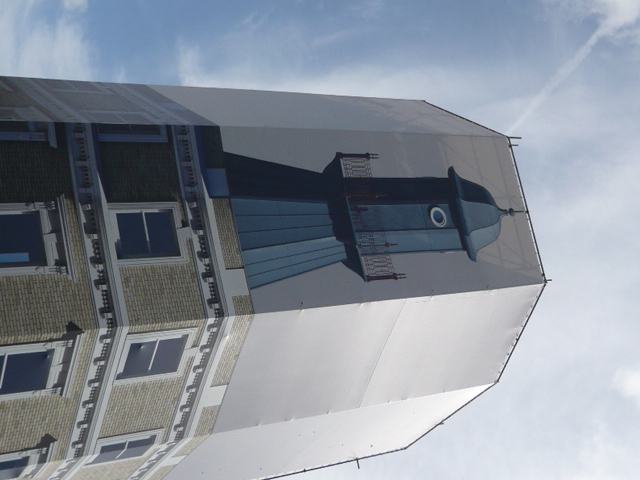 I particularly love the lighthouse building, and look forward to when it’s all shiny and new looking again. I had assumed it was public knowledge that there was going to be a Co-Op store on the ground floor of the Lighthouse Block [good to have a less ideologically unsound alternative to Tesco for those needing to do supermarket shopping round here]; I saw licensing application notices on the lampposts some while back, regarding the Co-Op applying to be able to retail alcohol there. Or maybe I’m the only local anorak who reads notices on lampposts?!? No I read the notice too. Just trying to find out the time scale now. Would like to have a good Co-op within walking distance. The planning docs suggest that the Lighthouse block doesn’t include the eastern end of the triangle. It’s all quite shabby that end so maybe it will be pulled down to allow space for construction equipment etc – although it would be a shame to see Americana Cosmetics go.